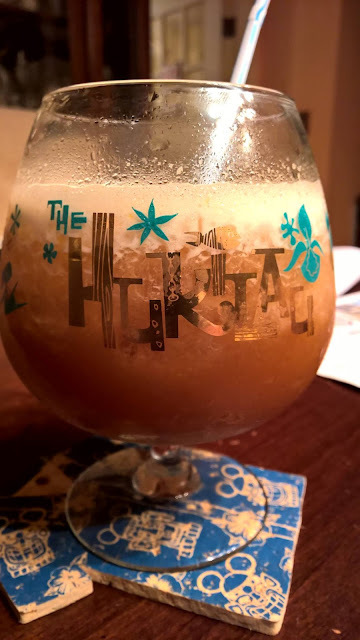 Now the formidable Doug Winship, arbiter of all things Tiki during February, has kicked things off officially, and on the heels of my previous post, I wanted to go into a preliminary explanation about the Trader Vic's Rum Keg experiment. Reading Vic's own words on the matter confirmed my suspicion that scaling a recipe up or down is, at best, an imprecise thing. As a result, with a handy Tasting Panel®, er, handy I made full-on Rum Kegs with the souvenir vessels I got from Trader Vic's. The problem is that those clock in at 64 oz (call it 2L for you metric types) apiece. This means that such a vessel is often sloshing around with a consignment of 12 oz -- let that register for a second -- or 350ml of rum at any given moment. Then we have the issue of the passion fruit. Some legit recipes call for syrup, others for nectar, others for pulp. 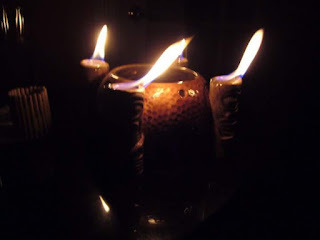 What brand of apricot liqueur/"brandy" is best? Ditto the sugar syrup and lemon issues, as mentioned last time. Then there's the issue of ice and blending. How much is "a scoop" of crushed ice? Some recipes specify a drink mixer, others a blender. So this is why this subject has been circling around my brain (and liver) since late November. And I'll leave you with this. 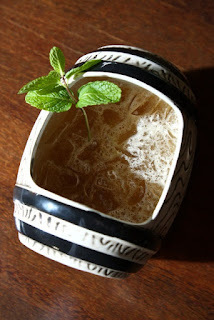 When I looked into the Scorpion Bowl last year all of the usual suspects had the same gripe with it: Citrus Riot. In ALL the many authoritative Trader Vic's Rum Keg recipes you will find, lemon juice is the second most prominent ingredient (4oz) after light PR rum (5oz). So that's where the first experiments took me.